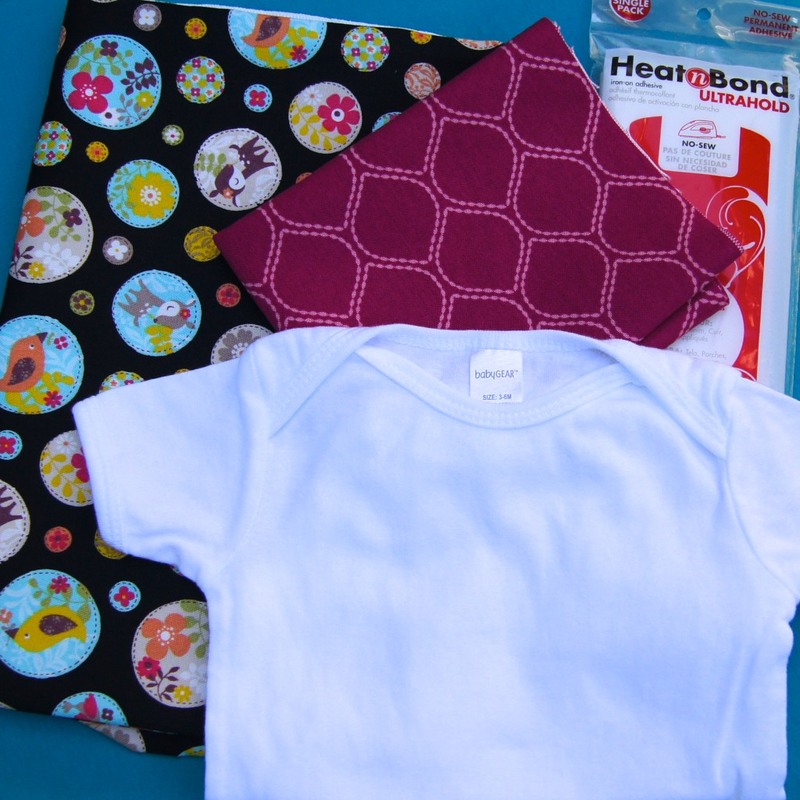 Yesterday, we talked a bit about the desire to gift handmade baby clothes and necessities. But to be honest, as much as we'd like to, we don't always have a lot of time to devote to baby gifts. So, we'd like to share with you some fast, simple project ideas for making your next baby gift extra-special. Ever since spotting these sweet kimono baby shoes on HomeSpun Threads, I knew that I would need to make them. Not want. Need! Combining tiny little shoes with an elegant kimono wrap construction, just one look and I was sold. Luck would have it that Aimee Larsen, the designer of these wee shoes, is also kind enough to share her pattern. Find it here! 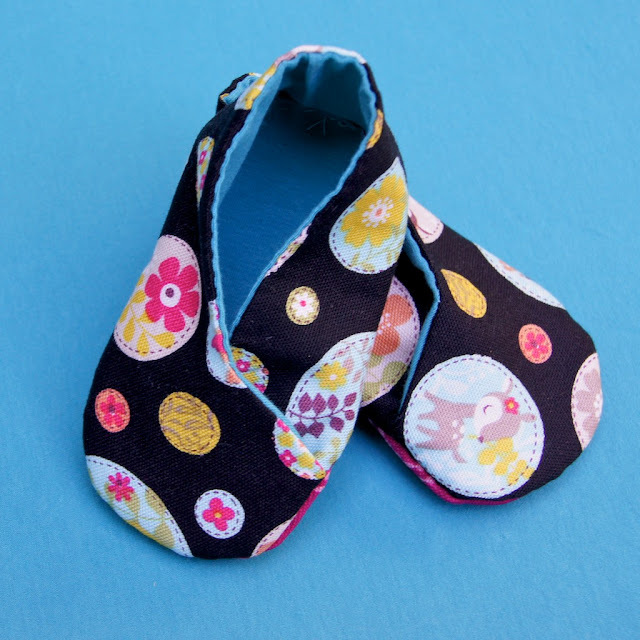 Aimee's Kimono Baby Shoes are really simple to construct. You just need the pattern, 2 or 3 coordinating fabrics and some appliqué adhesive (I used Heat 'n' Bond Lite). For the uppers, I chose a cute Cosmo print, available on Omiyage.ca (but be warned, we only have a little bit of this fabric, and when it's gone it's gone! ), an Echino print for the soles and some lovely soft turquoise jersey for the inside of the shoes. I ended up sewing these by hand but imagine that on a machine, this project would take you under an hour. Of course, sweet little shoes deserve a matching outfit - don't they? Or at least a matching onesie. My first experience with appliqué, and I'm pretty smitten already! To make your own appliqued onesie to match those new shoes, you'll need a onesie, Heat 'n' Bond Ultra Hold or another appliqué adhesive, fabric of choice. 1. Wash, dry and press onesie and fabric to remove sizing and allow for any shrinkage. 2. If you want your appliqué to be in a specific shape, cut that shape out of the appliqué adhesive. I skipped this step since my design uses the bubbles or circles already found in the fabric design. 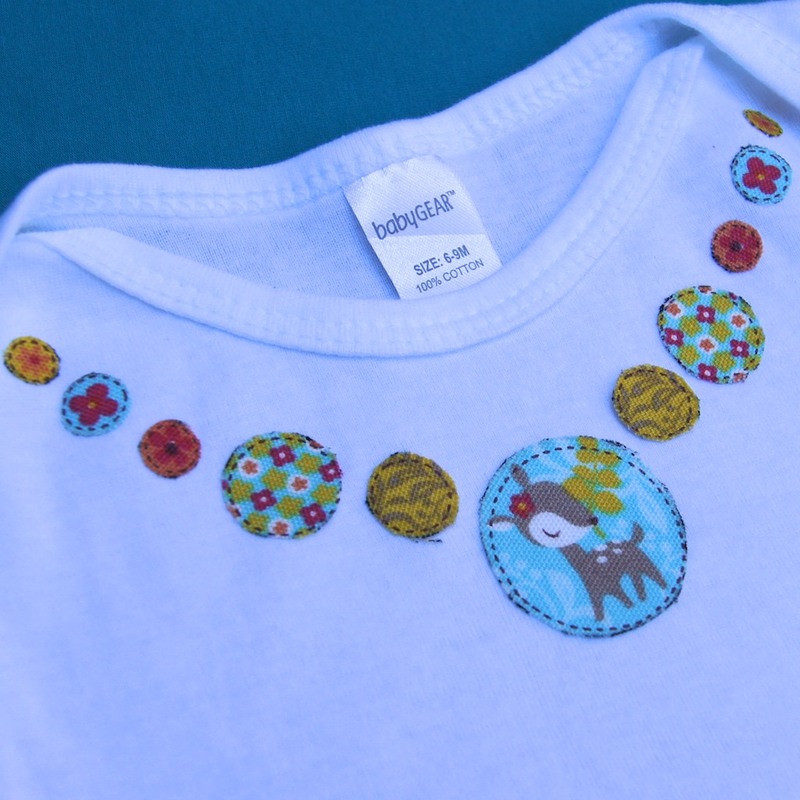 If you would like to create a similar necklace effect by cutting circles out of fabric, simply cut a piece of adhesive slightly smaller than the piece of fabric you will be using. 3. Follow the directions on the appliqué adhesive packaging and iron the adhesive to your fabric. Allow to cool. 4. When cool, cut to the desired shape. I cut around the bubbles in the Cosmo fabric - you can recreate the look of my project by cutting circles of various sizes from your fabric. 5. 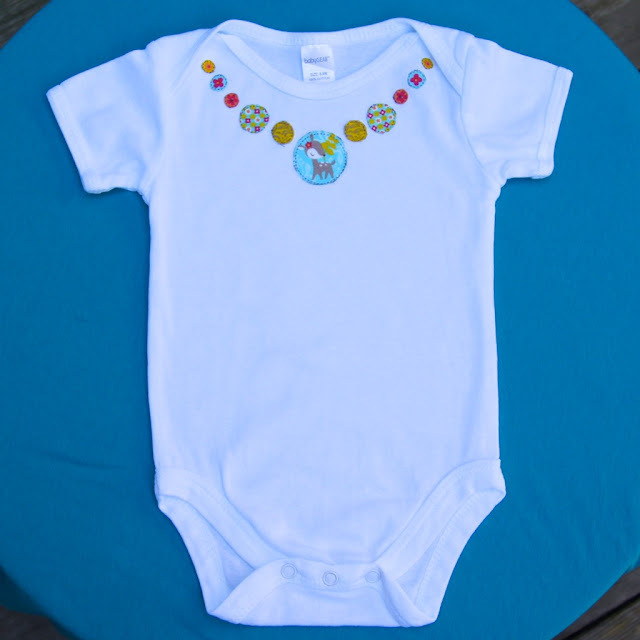 Determine your desired layout on the onesie - I went with a faux necklace look. Follow the directions on the appliqué adhesive packaging and iron the appliqué onto the onesie. If using multiple pieces, place and iron one at a time. Allow to cool. That's all! After doing a fair amount of appliqué research online, I determined that, while it is better to stitch around your appliqué, you can skip this step by using the Ultra Hold adhesive. You may find that the edges of your appliqué start to fray - many people enjoy this look, if you do not, use a Lite appliqué adhesive and sew around the edges of the appliqué. If you choose not to sew around the edges, and over time the edges of your appliqué start to come up, you should be able to press them down again following the directions on the adhesive. I would also recommend using Fray Check around the edges of the no-sew appliqué - you know, to held keep fray in check! Regardless of whether you choose to sew or not to sew, appliquéd garments should be washed in cold water on the Delicate cycle and tumble dried low on the Delicate cycle. Check back with us tomorrow for another project idea for baby! Check out Omiyage's fabric section for more great Japanese fabrics! Those shoes are just too cute! I think I'll try to make them for all the new nieces I have this year. These are the cutest little pair of shoes I have ever seen. I definitely want to get these for my daughter! Thank you for linking up. These are really, really cute. I'll feature this on the HomeSpun-Threads Facebook page. Thanks to you Aimee for sharing this adorable pattern! These were simply delightful to make! I liked your pattern especially of kimono shoes. It is something different and will make your kid look striking if he/she wears it. Everyone wish that her toddler looks different from others and I liked your idea of choosing unique Baby Gifts for your toddler. Kimono Baby Shoes are looking cool and cute. I good thing with this shoes is we can design its layout by our self. This is just too cute for words. Love this the way you posted this DIY tutorial. So useful.